Some characters’ minds barely make a peep – I always wonder whether their inner voice can really be so still. Other characters spend the entire story chattering away in italics – solving problems, questioning motives, or just reminiscing. What about your character? What do their thoughts sound like? 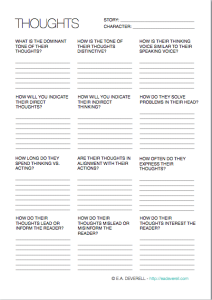 I do hope this worksheet will help you decide! 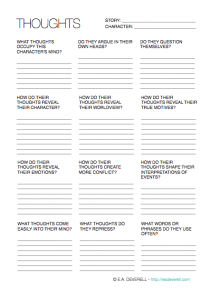 You can find a complete PDF of all of the writing worksheets to date in the Coterie.